On Wednesday, July 15, 2009, Chicago Gateway Green hosted its 4th Annual Texas Hold ‘Em charity tournament at Galleria Marchetti (825 W. Erie St.) to help raise money and promote awareness of its efforts to green and beautify Chicago. The World Series of Poker qualifying tournament hosted approximately 300 attendees and raised a record total of nearly $35,000, the highest amount in the tournament’s four-year history. Participants in this year’s event played for the grand prize donated by Horseshoe Casino: a spot in the 2010 World Series of Poker Tournament in Las Vegas, Nev. This year’s winner was Moses Chung of Chicago. Other prizes were given to top ten finalists and other players. Due to the charitable nature of this tournament, no cash was awarded. 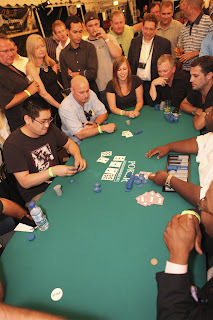 The celebrity packed event included poker enthusiasts and supporters of Chicago Gateway Green, including former Chicago Bears player Jerry Azumah, NBA star Chris Duhon, State Representative John Fritchey, Ward 33 Alderman Richard F. Mell, Survivor: Fiji’s Mookie Lee and Survivor: Palau’s Gregg Carey. Other media personalities included Kelli Zink of CelebTV, Jackie Tranchida of Metromix on CLTV, Natalie Martinez of NBC 5, Marcus Riley of 24/7 Chicago and NBC Chicago, President Obama impersonator and NBC-5 Street Team member Reggie Brown, Hannah Stanley of ESPN Radio and Audarshia Townsend, the 312 Dining Diva. The event was emceed by B96 afternoon radio personalities Doug Stylz and Justin Roman. Ginger Zee and Rob Elgas of Chicago’s NBC 5 also attended the event to announce they are the co-chairs of Green Tie Ball 2009, Chicago Gateway Green’s annual gala happening Saturday, September 26 at Chicago Illuminating Company and surrounding vicinity (2110 S. Wabash in the South Loop). Players and spectators enjoyed culinary treats from Galleria Marchetti and an open bar with premium liquor, including cocktails by event partner SYN Vodka. Other partners for the tournament include Horseshoe Casino, Chicago Magazine, WBBM-AM, 96.3 WBBM-FM, Votre Vu, Diva Limousine, 316 Barber Spa, Joseph A. Bank and Kurman Communications, Inc. The event was produced by McGowan Durpetti & Associates for the third consecutive year. River North’s newest hot spot, Bull & Bear (431 N. Wells St.) hosted the official after-party of the tournament, donating $5 for each player that attended. Chicago Gateway Green is a non-profit organization that has been dedicated to the greening and beautification of expressways, gateways and neighborhoods of Chicago for more than 20 years. For more information about the organization, call (312) 540-9930 or visit http://www.gatewaygreen.org/.